At one stop, when Obama walked out on stage, "It happened again: another heckler broke into Obama's speech. A man in the balcony repeatedly shouted out, 'Executive order!' demanding that the President bypass Congress with more unilateral actions." Obama confirmed to the audience that, yes, people did want him to sign more executive orders and "basically nullify Congress." At that point, wrote Remnick, "Many in the crowd applauded their approval. Yes! Nullify it!" These were not wild-eyed tent-dwellers on Wall or some lesser street. These were potential donors. 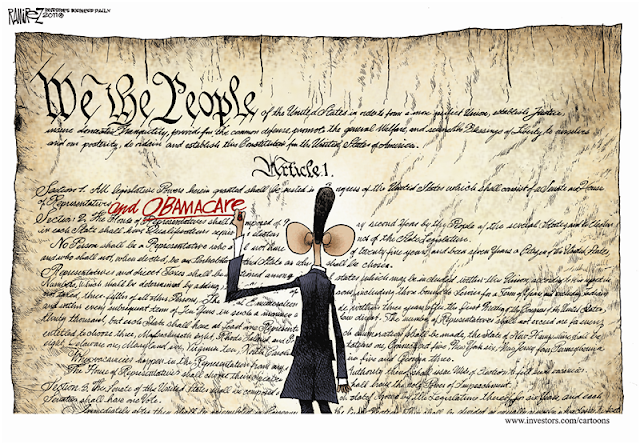 By 2014, Obama had successfully nullified any number of laws with negligible media objection. In February 2011, for instance, Obama and "wing man" Attorney General Eric Holder came willy-nilly to the conclusion that the Defense of Marriage Act (DOMA) was not "constitutional." President Bill Clinton signed DOMA into law in 1996 with overwhelming support from Democrats in Congress and nearly unanimous support from Republicans. No matter. Going forward, Obama decided that the Justice Department would no longer enforce DOMA. That simple. Constitutional scholar Jonathan Turley had a hard time making legal sense out of Obama's left-field decision to ignore DOMA. For one, Turley found the timing curious. The Obama administration had been defending the law for the previous two years, and the president, publicly, at least, had not changed his personal stance on redefining marriage. For another, Obama was basing this policy change on an interpretation "that had thus far remained unsupported by direct precedent." By refusing to enforce DOMA, Obama was setting a precedent and not a good one — namely, that a president could refuse to defend a law based on a legal interpretation that no court had ever accepted. In his 2006 book, Audacity of Hope, Obama praised the system of checks and balances in that it "encouraged the very process of information gathering, analysis, and argument." Once Obama ascended to the presidency, all those checks and balances just made it harder for him to transform America. Obama's constituencies, especially labor and the Hispanic lobby, wanted action, not gathering and arguing. They started leaning on him to ignore Congress and act unilaterally. One minor obstacle stood in the way, and that was Article I, Section 7 of the Constitution. For the previous 220 years, that article had informed Congress in some detail on how to turn an idea into a law. Obama could not enforce the DREAM Act, said constitutional scholar Nicholas Rosenkrantz, "by pretending that it passed when it did not." As late as March 2011, legal scholar Obama seemed to agree. "America is a nation of laws, which means I, as the president, am obligated to enforce the law," he told a Univision audience. "With respect to the notion that I can just suspend deportations through executive order, that's just not the case, because there are laws on the books that Congress has passed." By June 2012, what Obama said in March 2011 seemed as stale as a morning-after bowl of tortilla chips. The president had lost his taste for all that legislative analysis and argument, given that the result was "an absence of any immigration action from Congress." Five months before the presidential election, he knew that the media would give him a pass, and he hoped Latinos would give him their vote. So he decided to dispense with debate and fix immigration policy by his own lights, confident he could make that policy "more fair, more efficient, and more just." This fix started with presidentially guaranteed relief from deportation for the so-called "Dreamers." On top of that came the right to apply for work authorization, both guarantees in full defiance of existing federal law. "There has long been a general consensus that a president cannot refuse to enforce a law that is considered constitutionally sound," said Jonathan Turley. That chapter was apparently missing from Obama's law books. On August 23, 2013, in a move that the major media barely noticed, the Obama administration subtly expanded the list of those who would be excluded from deportation. Deep in a nine-page memo from U.S. Immigration and Customs Enforcement headquarters to its field offices was an order that "prosecutorial discretion" be shown to parents or guardians of United States citizens and lawful permanent residents, AKA "Dreamers." The news scarcely troubled the media, let alone the citizenry, but at least a few Republicans noticed. "President Obama has once again abused his authority and unilaterally refused to enforce our current immigration laws," said House Judiciary Committee chairman Bob Goodlatte. Jonathan Turley agreed. "In ordering this blanket exception," said Turley, "President Obama was nullifying part of a law that he simply disagreed with. There is no claim of unconstitutionality." Said Rosenkrantz, "Exempting as many as 1.76 million people from the immigration laws goes far beyond any traditional conception of prosecutorial discretion." Encouraged by the media to keep drafting laws of his own choosing, Obama made nullification a central part of his governing philosophy. "I'm eager to work with all of you," he said to Congress of the 2014 State of the Union speech. "But America does not stand still — and neither will I. So wherever and whenever I can take steps without legislation to expand opportunity for more American families, that's what I'm going to do." Said veteran civil libertarian Nat Hentoff, "Obama is a bad man in terms of the Constitution."